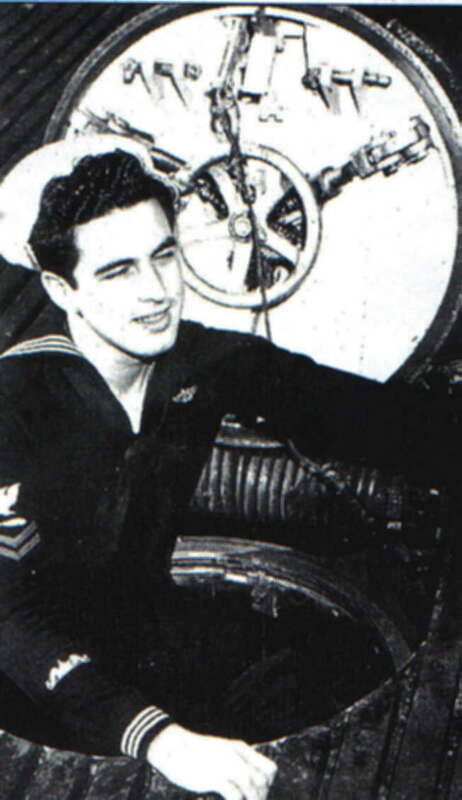 Dallas Cheesman, WWII crewmember on the USS Sterlet, (SS-392) weighed anchor for his final patrol on May 17, 2004. Per Cynthia Aukerman, News-Gazette reporter, Winchester, Ohio., July 5, 2003 "Winchester resident Dallas Cheesman knows exactly where he was 59 years ago on July 4 - aboard the submarine USS Sterlet heading out for its first patrol. His wartime service taught him what Independence Day is all aout. "Your country is worth more than your life," Cheesman says. "Your country is more than the flag. It's about your family and friends, Your way of life." Cheesman enlisted in 1942 when he was 19. He asked four times for submarine duty, which is all-volunteer, but the Navy kept sending him to other schools. He didn't attend formal submarine school but took the battery of tests, mainly for claustrophobia and intelligence. Then he attended torpedo training, where he was named an "honor Man." With 80 men in a narrow tube a little longer than a football field, the Sterlet was crammed tight. Cheesman's bunk was right above two very big torpedoes, with about six inches of head space. "I couldn't get in that bunk nowadays," Cheesman says. "It required some pretty acrobatiac moves to get up there without smacking my head on the ceiling." "The submarine smelled of fuel oil from the diesel that powered its engines. If a sub stayed submerged too long, the oxygen would be depleted, but the crew couldn't use the emergency oxygen tanks until men started passing out. "Before the pass-out stage, crew members put down a mattress cover and sprinkled a powder that consumed carbon monoxide while giving off oxygen." Cheesman hasn't forgotten how that powder made him cough and how he would keep his face in a pillow to be able to breathe. "The Sterlet sank 13 japanese ships, two destroyers and 11 merchant ships (tankers and transports). The Navy's review board just recently gave the Sterlet credit for its 14th ship, almost 60 years after the action. "We fired, and we thought we hit it," Cheesman recalls. "But we were too busy running to make sure." "In 1945, Cheeman's picture (enclosed) coming out of a torpedo hatch appeared in the San Francisco Chronicle. The newspaper offered to send the photo to his home-town newspaper, but Cheesman vetoed that idea. "I just wasn't ready," Cheesman said. Now he shares his story with local school students and cherishes his work with fellow submariners. "At each of their meetings, the veterans conduct a "tolling of the boats," and pay special tribute to any boat that was sunk during the month the reunion is being held. "Each year the veterans pay trubute to their friends who are passing on to their next duty. "And the roll call of World War II submariners gets shorter every year. USS Sterlet "I have watched their sleek hulls slip silently from nowhere ports as their crews in non-descript dress lined up for a last glimpse of land. "Every sailor has an opinion of where the boat is headed, but they await the skipper's orders. Their destination would soon be announced, but their fate would be unknown. "It always seemed the patrol really began with the first dive, when silently the boat slipped beneath the outside world. There she hung suspended by the golden thread of life, perhaps to be snipped in some far-away sea in an underwater wold populated by 80 men. "The boats and their personnel always looked the same. The officers, always alert and fully aware of their responsibilities, were leaders of men. The chiefs were seafaring men who were born too late to sail a three-master. The crews were very young men with happy faces that belied their alertness and bravery. They left their teenage years to serve, and serve magnificiently, a great nation with a great purpose. "When the bell tolls and a flower is tossed into the water, we see you all again. We remember each of you, and we miss you. Perhaps we will serve together sometime in the future. Thanks to Cora Cornelison for sending this tribute. Cora's brother Elmer Olmstead sailed on the Sterlet with Dallas and will remember him always. Godspeed Dallas... sailor, rest your oar!